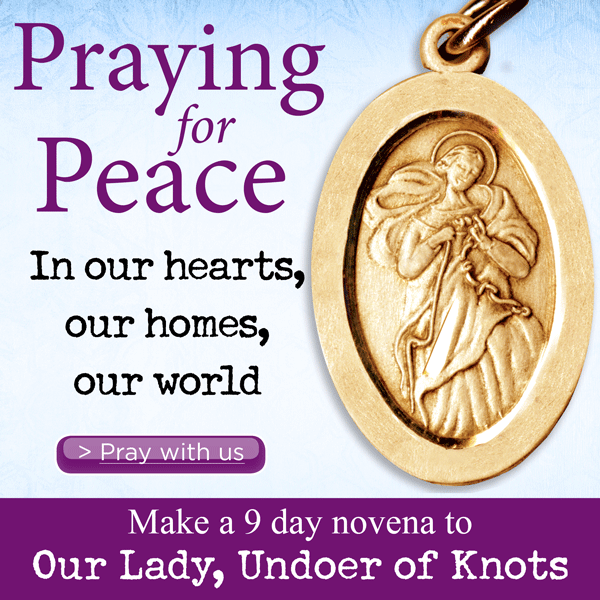 This virtual novena to Our Lady, Undoer of Knots is based on my book, Our Lady, Undoer of Knots: A Living Novena (Guided Reflections from the Holy Land). The meditations and prayers are excerpts from the book, and tailored to form a novena that is easily read and followed online. You’ll find the full novena as well as extended reflections on my experiences in the Holy Land as part of Pope Francis’ historic pilgrimage there in May, 2014 in the book. The knots contained in the novena are nine of the most common knots that disturb the peace in our hearts, homes, and world. If you aren’t experiencing that exact knot right now, chances are that you have in the past or will in the future or have someone close to you who is or will be. Regardless of what knot or when, they all cause sinfulness and separation from God. We need Our Lady, Undoer of Knots to undo it. At one time or another, nearly all of us encounter injustice – toward ourselves or someone we care about. Injustice comes in many forms, but the end result is much the same. It can cause us to become caustic and vengeful, even hateful. It can even lead us into violence and destruction. In order to counter injustice, we need the gifts of the Holy Spirit. The injustice I bear infuriates me. I don’t want to surrender it; I want to avenge it. I want what I believe I deserve. I want the perpetrator of the injustice to make amends. I want to take matters into my own hands and set things right. That might not be the godly way of doing this, but it’s the way I’d prefer to do them. Mother, help me to turn away from my sinfulness and toward God. Take this knot of injustice from me [name the knot] and hold it fast in your hands so that I won’t be be able to take it back. Work on it with all your love and diligence so that it becomes a source of grace and growth rather than a source of anger and resentment. Dear Lady, along with the knot itself, I place into your hands those who have been unjust to me and any others affected by their actions. Guide them to repentance and conversion of heart. Mother, pray for me and for all those who bear the burden of injustice. I also want to unite my prayers with those of Pope Francis asking that lasting peace may be granted to the world. Amen. Say one Our Father, one Hail Mary, and one Glory Be for peace in our hearts, homes, and the world and for the intentions of the Holy Father. Make a concrete resolution to take one step toward peace in your heart today. Our Lady, Undoer of Knots. Bookmark.